Shop Best Deal Magazines online at BestDealMagazines.com for some of the lowest magazine subscription prices found online. Best Deal Magazines ships your favorite magazines quickly and conveniently, from family and fishing to news and music titles and everything in between. Check back often at 58Coupons.com for the latest Best Deal Magazines coupons, Best Deal Magazines discounts, Best Deal Magazines promotions and Best Deal Magazines savings for BestDealMagazines.com. Use this coupon code to save an extra 20% on weekly specials from Best Deal Magazines. Click link and shop. Just use this exclusive 58Coupons coupon code to get an automatic 15% off your order from BestDealMagazines.com. Click link. Use this code to get $10 off when you spend $50 or more at BestDealMagazines.com. Click link. Use this coupon to get $5 off your order of $30 or more at BestDealMagazines.com. Click link. Get the Complete Idiot's Guide To Wine for free (valued at $18.95) from BestDealMagazines.com when you use this coupon code. For all those bargain hunters out there; here's a screaming deal for you from Best Deal Magazines. Over 100 magazines are only $4.69 for each one year subscription. Be sure to click on the $4.69 Subscription link on the left. Buy a subscription from Best Deal Magazines and you'll receive a free gift with every order. Click link to get started. Enjoy this coupon code from Best Deal Magazines to save 40% on a fabulous modular wine rack. Click link. 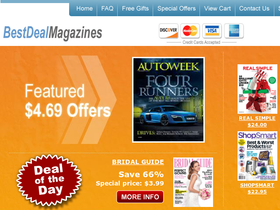 Get $7.50 off $40 with this coupon code at BestDealMagazines.com. Click link.